When Shawnee Custalow of A Lovely Photo reached out to us, I knew she’d be perfect for APW. From a glance, I could tell that the Richmond, Virginia-based photographer’s work #SLAYS, but when I found out that these jaw-dropping images were taken by a self-proclaimed queer Southern feminist who travels throughout the continental US for free with rates starting at $2,400, there may have been actual fist-pumping. You see, if there’s one thing I’ve been reminded of in the past weeks, it’s that while marriage equality may finally be here, real and true on-the-ground equality is still very much a work in progress, and photographers like Shawnee—specifically passionate about working with LGBTQIA+ couples—are still one hundred percent necessary. As a queer woman, I understand how awkward it can be to genuinely interact with your partner in front of someone who can never completely understand the hesitations that we face on a daily basis to just be ourselves. We can legally get married now, but that in no way means that all of society is suddenly wholeheartedly accepting and supportive. It is my hope to lessen that burden for any queer couple, and document their day in a way that is completely authentic and quintessentially them. I’ll never ask you to pose in a way that doesn’t resonate with your gender identity or how you present yourself, or makes you feel awkward or out of place. 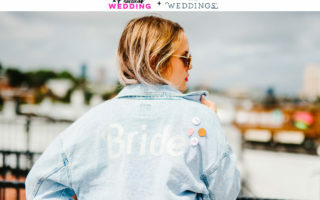 I found APW while on a hunt to find examples of real weddings that resonated with me on a personal level. Celebrations that were more about the connection a couple shared and the support that their community offered, rather than a thousand detail shots of flowers or cheesy fake poses. I love that APW couples are down-to-earth and get that what really matters on their wedding day is real moments, real feelings, and a really important commitment to themselves and their community. My goal is to make sure you are one hundred percent comfortable with me photographing you on your wedding day. I don’t want you to have to second-guess anything, just to enjoy your celebration and take in the incredible moments that are happening all around you. Your expressions should be natural and reflect who you really are. I believe the best images are created when your personality gets to shine through an already incredible moment; I’m just fortunate enough to be there and capture the realness. I’m a sucker for raw human emotion, and live for the fleeting in-between moments that seem to pass us by so quickly. I strive to make sure my images are bright and colorful, and chock-full of down-to-earth realness. My shooting style is very nonintrusive and laid-back, while searching out details and unseen moments. I try to blend into your event without being in the way or making the whole day feel like a photo shoot. OMG I’M SO OVER THE MOON AND VERY LUCKY BECAUSE THESE ARE SO RIDICULOUSLY GORGEOUS AND AMAZING. I DON’T EVEN KNOW WHERE TO BEGIN TO TELL YOU HOW FANTASTIC YOU ARE!!!!!!! Like, SERIOUSLY, damn, woman! We watched it through three times in a row because they are so beautiful! I can’t thank you enough for all the work and effort that went into this project for you, and I am simply in awe and admiration of your talent and expertise. You captured moments that I completely forgot happened, ones that I was so happy to witness even though I wasn’t present for them, ones that made me and my heart smile so big! Rebecca said she can’t believe how comfortable she felt being photographed the whole time, and that means a lot to me. The lighting, the tree, the smiles and laughs, the emotion, the things that all touched my heart, and made our wedding really feel like OURS… you just captured it all perfectly! I am so grateful, truly. You are amazing, and I’m so happy we have found you. I can’t wait for something else major to happen for us so I can call you again! Engagement sessions, second photographers, and worldwide travel are also included depending on the package, and special rates are available for weekday elopements and celebrations. Additionally, Shawnee is offering special rates on all portrait sessions, elopements, and small weddings that correspond with her existing travel throughout the US and Europe this coming fall—check out her calendar here to see if she’ll be in your area! Really, whether you’re a member of the LGBTQ community or not, or are currently getting married or not, you should probably head over to A Lovely Photo (or follow Shawnee on Instagram) to see more gorgeous, stylish couples practically glowing with love. And if you’re getting married, um, anywhere, Shawnee will come to you to capture you as your most gorgeous, stylish, and radiant self. A LOVELY PHOTO IS OFFERING special rates for portrait sessions/elopements/small weddings during her travel dates throughout the US and Europe this fall. CHECK HERE TO SEE IF SHE’LL BE HEADED YOUR WAY, and CLICK HERE TO BOOK.